​Chiropractic adjustments of the spine and other joints restore proper alignment and movement, while improving the function of the nervous system. We employ a variety of safe, gentle techniques at our office in Jacksonville and Fleming Island, FL, which are effective in treating all age groups from infants to seniors. Based upon published research; chiropractic has been shown to be the most effective form of treatment for low back and neck pain. Injuries can occur at any time. You can be injured during common activities like driving, playing sports, exercise, or just hanging out at home. Physical therapy is a branch of medical science utilizing a variety of non-invasive treatment modalities to retrain the body back to normal function. Following an in-depth evaluation, we can tailor a specific program to help patients regain these lost functions and return to normal activity. Massage is quite beneficial for increasing the level of oxygen in the bloodstream, eliminating muscle toxins, improving circulation and increasing flexibility while easing tension and pain. Our licensed massage therapists are certified in several different techniques, allowing us to address each individual’s unique needs. Select Health and Wellness strives to provide individuals with the tools and services to promote healthy lifestyles. We understand the difficulties that busy individuals face and how easy it can be to put wellness on the backburner. This is why we offer corporate wellness events for companies to provide their employees with a little pampering or healthy tips. Click Here for more info! Whether you are a Super-Athlete or Super-Mom, giving your body ample time to recover is essential. Our carefully chosen collection of recovery tools and services, previously reserved exclusively for professional athletes, are now available to all of our patients. Our therapies and products are on the cutting edge of sports science, and our recovery suite progresses with research, results, and of course feedback. 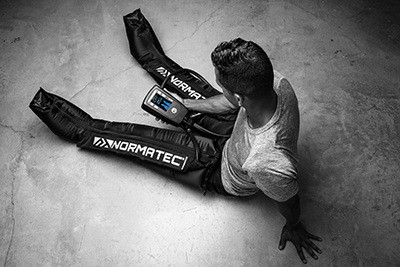 NormaTec is the leader in rapid recovery – these systems give a competitive edge to the world’s elite athletes, coaches, and trainers. It was developed by a physician bioengineer, and a number of recent research studies have been published indicating the system’s efficiency in enhancing blood flow, decreasing inflammation, and speeding recovery time. How it works: To enhance blood flow, decrease inflammation, and speed recovery, the NormaTec recovery system utilize three massage patterns: pulsing, gradients, and distal release. The pulsing pattern employs dynamic compression as opposed to static compression to enhance the movement of fluids and metabolites out of the extremities after a difficult workout or performance. Different gradients of pulsing and pressure mimic lymphatic vessels and veins by holding pressure in the proper places to prevent the fluids from heading in the wrong direction, which delivers the right pressure in every zone of lower extremity recovery. The distal release pattern helps each portion of the extremity gain maximal rest time without pausing the compression, which prevents the backflow of fluids in the lower extremities. Thus, the fluids that cause the pain and that slow recovery time are less likely to remain in that extremity region. What to expect: When a patient uses our systems, they will first experience a pre-inflate cycle, during which the connected attachments are molded to their exact body shape. The session will then begin by compressing their feet, hands, or upper quad (depending on which attachment they are using). Similar to a pulsing manner and then release. This will repeat for each segment of the attachment as the compression pattern works its way up their limb. The Results: Reduced pain, swelling and stiffness. Increased range of motion and flexibility. Speeds up muscle recovery flushes lactic acid. We will be offering this system in both 25 and 50 minute sessions. When patients ask what the difference is between the two (aside from price) it would be the difference between a 25 and 50 minute massage. It lasts longer, the results tend to be greater, and the recovery is speedier. 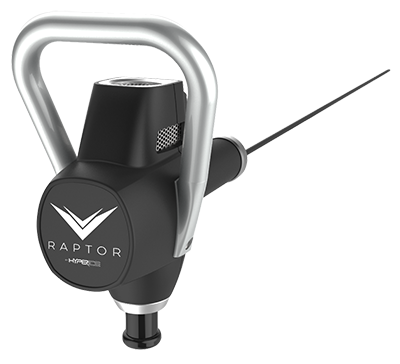 The RAPTOR is a state- of- the art system that enhances and accelerates therapeutic recovery in sports medicine, post operative recovery and general physical rehabilitation. Its rapid mechanical percussions penetrate several layers of muscle with up to 3600 percussions per minute! One of the RAPTOR'S many benefits include bypassing the body's inflammatory response and inhibiting the nervous system's pain response, unlike any other form of deep tissue therapy. LightForce Therapy LaserR by LiteCure Medical, LLC. 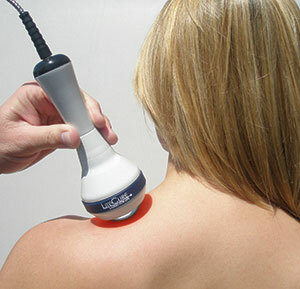 This innovative and effective technology offers instant relief of pain, reduced swelling, and increased healing times. 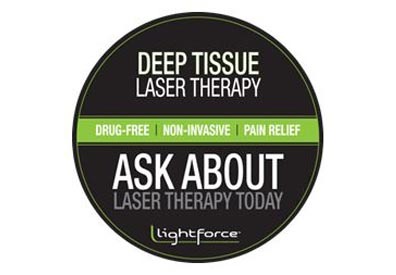 Cleared by the FDA in 2007, the Class IV therapy laser delivers light energy into the patient's body. When this light interacts with damaged cells, cell respiration is improved, inflammation reduced, and nerve conduction slowed for immediate relief from pain. Patients suffering from migraines, musculoskeletal pain, sports injuries, neck and back pain or conditions, now have an alternative to surgery anddrugs. This is: Drug-Free, Surgery-Fee, Pain Relief. Call us today for more information. For additional information, please review the services and conditions listed below. Call (904) 425-9060 today to make an appointment!